It’s undeniable – a photo booth is a must at any event now. They not only entertain your guests with so much fun and laughter they give you and your guests a wonderful momento to remember the night. But, there is the question of cost. Maybe you’re thinking a ‘do-it-yourself’ option might be better where you purchase the props and have a camera set on a pole, or you provide disposable cameras, or maybe your photographer can set up a corner and he/she takes the photos. There are many options and it can be a real hit-or-miss experience. From talking with our clients’ guests and venue owners, we have found the DIY option has caused a lot of frustration with time and effort to set it up and then on the night it doesn’t get used much (or at all), if you have an album – it’s empty, and don’t forget the mess. all details handled by us. and setting up & packing away. or do you leave it to it’s own devises? often parents and the more mature to use the set up. haven’t used a booth before). A photo strip designed with your A simple one shot framed photo. guests to add a photo strip and for you and your husband/wife. encourage your guests to fill the or even use it? Will any children abuse it? together – and the attendant is there working together? should any issues arise. What if something goes wrong? We give you a USB at the end of the No USB. 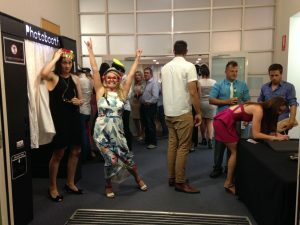 Stress less and Let My Event Photobooths bring the fun while you and your guests enjoy the night and take home your beautiful mementos.